NACRA has been following the development of the F16 class meticulously. Mainly consisting of homemade boats at first, but now maturing as the F16 class received the ISAF status “recognized class” at the end of 2010. After receiving this news, NACRA decided it was time to get involved and started developments. In NACRA’s opinion it will also lift the F16 class to the next level when “well established manufacturers” like NACRA are entering this class towards the future. 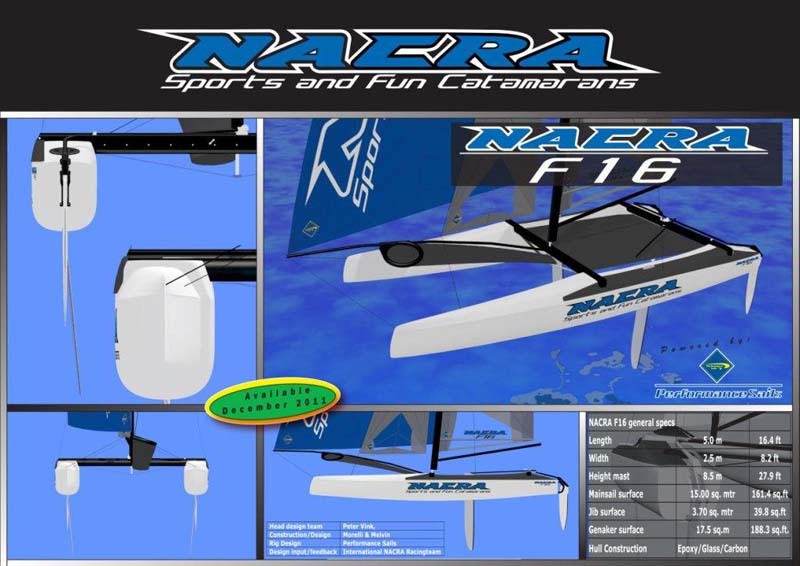 The NACRA F16 is designed & engineered by the world famous multihull construction company Morrelli & Melvin based in Huntington Beach California USA. Peter Vink overseeing this F16 project as counterpart on behalf of NACRA explains on the NACRA F16. Morrelli/Melvin already proved to be a successful combination with NACRA with several earlier designs such as the NACRA Playcat (1995), NACRA Inter F18 (1995), NACRA F18 Infusion(2005) & The NACRA F20 Carbon(2009). Both F18’s designed by Morrelli/Melvin became World Champion in the F18 class numerous times, the F20 Carbon is proving to be a true racing machine sailed by the more heavier sailors and winning events on line honors and handicap. Morrelli/Melvin is widely involved in the latest America’s cup designs and always on top of what knowledge is available to implement in new designs such as this NACRA F16. 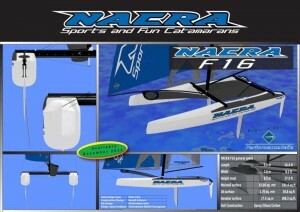 The NACRA F16 will become available for delivery in December 2011. For pricing, please contact your local dealer/distributor. With over 40 of these boats sold around the world so far it is sure to be a big hit.!!! NACRA, always one step ahead!